With thanks to Darryl Fuller, I was able to supply information on the miniature sheet, and sale of the imperforate prestige booklet. 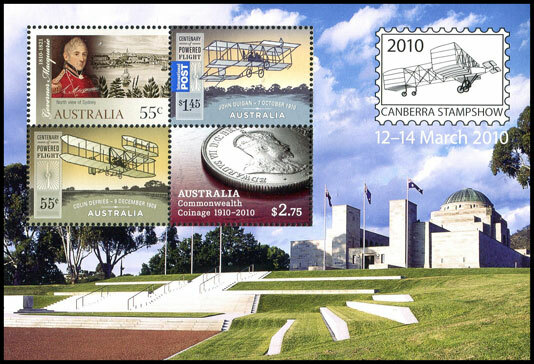 The show miniature sheet includes a se-tenant block of four stamps, featuring the 55c Macquarie, $2.75 Centenary of Australian Coinage and 55c and $1.45 Centenary of Powered Flight stamps. There was some confusion over the issue date of the miniature sheet. In Stamp Bulletin No. 303 Australia Post gives an issue date of 9 March on page 25, and 12 March on page 26 and in the order form. It turns out that 12 March was the issue date, although Australia Post did not have a stall at the show until 13 March. There were some differences between the miniature sheet stamps and regular sheet stamps. Information on these differences are found on the corresponding issue pages: 55c Macquarie and 55c and $1.45 Centenary of Powered Flight stamps. As the Macquarie and Flight stamps differ, but not the Coin stamp does not, suggests that Energi Print printed the miniature sheet - they printed the Coin issue, while McKellar Renown printed the Macquarie and Flight issues. * Australia Post did not have a stall at the show until 13 March. Weston Creek Post Office had stock of the miniature sheet on 12 March. The numbered imperforate Macquarie prestige booklet were only available at the show. The booklets were only sold to those who bought an entry ticket, and were be limited to 100 on Friday, 100 on Saturday and 48 on Sunday. Numbers 1 and 250 will be sold at auction. By the end of the show all booklets were sold out. The booklets were sold for $60 each. Individual stamps from the sheet are listed on each issue's page.